From 1942 to 1943, general Italo Gariboldi commanded the Italian Army in Russia (Armata Italiana in Russia, or ARMIR, or Italian 8th Army). He was personally in command of the Italian troops destroyed in the Battle of Stalingrad after bloody fighting. The Italian participation in the Eastern Front during World War II began after the launch of Operation Barbarossa, the German invasion of the Soviet Union, on 22 June 1941. To show solidarity with the Germans, Italian dictator Benito Mussolini ordered a contingent of the Italian Royal Army to be prepared for the Eastern Front and, by early July, an Italian force was in transport. Mussolini did this despite the lack of enthusiasm shown by German dictator Adolf Hitler. From 1941 to 1943, the Italians maintained two units on the Eastern Front. The first Italian fighting force was a corps-sized unit called the Italian Expeditionary Corps in Russia (Corpo di Spedizione Italiano in Russia, or CSIR). The second force was an army-sized unit which subsumed the CSIR. The second force was called the Italian Army in Russia (Armata Italiana in Russia, or ARMIR) and was also known as the Italian 8th Army. The Italian Army in Russia suffered heavy losses during the Battle of Stalingrad and was withdrawn to Italy in 1943. Only minor Italian units participated on the Eastern Front past that point. Constituted on 10 July 1941, the Italian Expeditionary Corps in Russia (Corpo di Spedizione Italiano in Russia, or CSIR) arrived in the southern Soviet Union between July and August 1941. The CSIR was initially subordinated to German General Eugen Ritter von Schobert’s 11th Army. On 14 August 1941, the CSIR was transferred to the control of German General Ewald von Kleist's Panzer Group 1. On 25 October 1941, Panzer Group 1 was redesignated as the 1st Panzer Army. The CSIR remained under von Kleist’s command until 3 June 1942 when it was subordinated to German General Richard Ruoff’s 17th Army. The CSIR's original commander, Italian General Francesco Zingales, fell ill in Vienna during the early stages of transport to the Soviet Union. 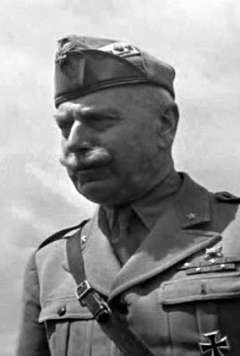 On 14 July 1941, Zingales was replaced by Italian General Giovanni Messe. The CSIR had three divisions: the 52 Motorised Division Torino, the 9 Motorised Division Pasubio and the 3 Cavalry Division Amedeo Duca d'Aosta. The CSIR was sent to the southern sector of the German advance in the Ukraine in July 1941. In August 1941, as part of the German 11th Army, the CSIR made its first contact with the enemy. The CSIR pursued retreating Soviet troops between the Bug River and Dniestr River. While the 11th Army besieged Odessa, the CSIR was attached to First Panzer Group under General von Kleist. In its early encounters it was successful, taking a number of towns and cities and creating a favourable impression on its German allies. Its most notable early victory came at the Battle of Petrikowka in September 1941, where the Italians encircled some sizable Red Army units, inflicting unknown combat casualties on them and capturing over 10,000 prisoners of war as well as significant numbers of weapons and horses. This cost them only 291 casualties of their own: 87 killed, 190 wounded, and 14 missing. On October 20, the CSIR together with the German XXXXIX Mountain Corps captured the major industrial center of Stalino (now Donetsk) after heavy resistance from the Soviet defenders. Units from the Pasubio Motorized Division captured the neighboring city of Gorlovka on November 2. While the CSIR did not participate in the siege of Odessa, Italian troops assisted in the occupation of the Odessa area after the city fell on 16 October 1941. With the onset of winter, the CSIR units began consolidating their occupation zone and preparing defensive works. In the last week of December, the 3rd Mobile Division was hit with a fierce counterattack by Soviet forces. They managed to beat back the attacks long enough for the German 1st Panzer Army to provide back-up to their sector and subsequently defeat the Soviet offensive. The "Christmas Battle" was hailed as a great victory back in Italy, though the division likely would have fell without German support. It subsequently weathered the 1941-1942 winter quite well in its relatively quiet occupation zone. Up to this point, the CSIR had taken 8,700 casualties. In July 1942, Mussolini scaled up the Italian effort on the Eastern Front and the CSIR became the 8th Italian Army. The 8th Italian Army was also known as the Italian Army in Russia (Armata Italiana in Russia, or ARMIR). The ARMIR was subordinated to German General Maximilian von Weichs' Army Group B.
Italian General Italo Gariboldi took command of the newly formed ARMIR from General Messe. As commander of the CSIR, Messe had opposed an enlargement of the Italian contingent in Russia until it could be properly equipped. As a result, he was dismissed. Just prior to commanding the ARMIR, Gariboldi was the Governor-General of Libya. He was criticized after the war for being too submissive to the Germans. Mussolini sent seven new divisions to Russia for a total of ten divisions. Four new infantry divisions were sent and included: The 2 Infantry Division Sforzesca, the 3 Infantry Division Ravenna, the 5 Infantry Division Cosseria, and the 156 Infantry Division Vicenza. In addition to the infantry divisions, three new Alpini divisions were sent; The 2 Alpini Division Tridentina, the 3 Alpini Division Julia, and the 4 Alpini Division Cuneense. These new divisions were added to the Torino, Pasubio, and Prince Amedeo Duke of Aosta divisions already in Russia. The ARMIR advanced toward the right bank of the Don River which was reached by July 1942. From 17 to 20 July 1942, the Italians fought for the possession of and captured the important coal-mining basin of Krasny Lutsch (southeast of Kharkov) with a rapid enveloping maneuver. This cost the army 90 dead and 540 wounded, while inflicting over 1,000 combat casualties on the Soviets and taking 4,000 Soviet troops as prisoners. On July 30, the highly-mobile riflemen (Bersaglieri) of the 3rd Cavalry Division Amedeo Duca d'Aosta rushed to relieve the German 587th Regiment, which was clashing with the enemy near the Soviet bridgehead at Serafimovich. The 3rd Division arrived on July 30, by which time the 587th Regiment had been reduced to only a few hundred men. Initial Soviet strength in and around the area (including the towns of Bobrovskiy and Baskovskiy) was 3,000 men and 40 tanks, but was increased soon after the Italians arrived. On July 30 and August 1 the Soviets attempted to stop the Italians as they were crossing the river to relieve the remnants of the 587th, but failed and lost several dozen tanks (primarily T-34s) in the process. The Soviets and Bersaglieri fought for the next two days, primarily in and around the town of Bobrovskiy, until August 3 when the Soviets were forced back to their brideghead at Serafimovich. The Italians then assaulted Serafimovich, which they took. Sporadic fighting continued around this area until August 14. The 3rd Division's losses from July 30 to August 14 were 1,700 killed and 200 wounded; Soviet combat casualties are unknown, but the Italians reportedly took 5,800 Soviet troops prisoner and captured 10 artillery pieces. On August 12, three Soviet divisions totaling about 30,000 troops and many tanks crossed the Don River to launch a counterattack on the Italian sector. They successfully took the 2nd Mountain Infantry Division Sforzesca by surprise and, with no tanks at its disposal and outnumbered four to one, the Sforzesca division was routed in two days. It subsequently withdrew to Yagodny, which was attacked by the Soviets on August 20. From August 20 to 24, the remnants of the division beat back several Soviet attacks and even launched some small scale counterattacks, until they mostly ran out of ammunition and were down to repelling the last Soviet probes with bayonets. Bersaglieri reinforcements arrived on August 24 and defeated the Soviets, sending the survivors retreating. The Italians refer to this as the First Defensive Battle of the Don. Italian losses were 900 dead, 4,200 wounded, and 1,700 missing/captured. 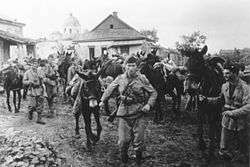 Also on August 24, 700 Italian horsemen of the Savoia Cavalleria routed 2,500 Soviet troops of the 812th Siberian Infantry Regiment near Isbushenskij. While taking 84 casualties (32 dead, 52 wounded), the Italians inflicted 1,050 casualties (150 dead, 300 wounded, 600 captured) on the Soviets, and captured 14 artillery pieces. While overall a minor event in the ARMIR's participation, the cavalry charge had great propaganda resonance back in Italy. By late autumn 1942, the ARMIR was placed on the left flank of the German 6th Army between Hungarian and Romanian forces. The German 6th Army was then investing Soviet General Vasily Chuikov's 62nd Army in Stalingrad. The Italian line stretched along the River Don for more than 250 km from the positions of the Hungarian 2nd Army in Kalmiskowa to the positions of the Romanian 3rd Army in Veshenskaja, a village 270 km northwest of Stalingrad. The Italians threw up a thin screen along the river. No trench lines had been dug nor effective defensive positions set up. Heavy snow and severe frost were hampering troop movements. The situation for the German troops in Stalingrad remained stable until the Soviets launched "Operation Uranus" on 19 November 1942. The aim of this operation was the complete encirclement and isolation of the German 6th Army. To accomplish this, the Soviets struck at the weak Romanian armies to the north and south of Stalingrad. The Soviets planned Operation Uranus as a double envelopment. The twin attacks smashed through portions of the Romanian 3rd Army and the Romanian 4th Army and successfully met at Kalach four days after the operation began. The situation for the Italian troops along the Don River remained stable until the Soviets launched Operation Saturn on 11 December 1942. The aim of this operation was the annihilation of the Italian, Hungarian, Romanian, and German positions along the Don River. The first stage of Operation Saturn was known as Operation Little Saturn. The aim of this operation was the complete annihilation of the Italian 8th Army. The Soviet 63rd Army, backed by T-34 tanks and fighter-bombers, first attacked the weakest Italian sector. This sector was held on the right by the Ravenna and Cosseria infantry divisions. From the Soviet bridgehead at Mamon, 15 divisions—supported by at least 100 tanks—attacked these two divisions. Although outnumbered 9 to 1, the Italians resisted until 19 December, when ARMIR headquarters finally ordered the battered divisions to withdraw. By Christmas both divisions were driven back and defeated after bloody fighting. Meanwhile, on 17 December 1942, the Soviet 21st Army and the Soviet 5th Tank Army attacked and defeated what remained of the Romanians to the right of the Italians. At about the same time, the Soviet 3rd Tank Army and parts of the Soviet 40th Army hit the Hungarians to the left of the Italians. The Soviet 1st Guards Army then attacked the Italian center which was held by the 298th German, the Pasubio, the Torino, the Prince Amedeo Duke of Aosta, and the Sforzesca divisions. After eleven days of bloody fighting against overwhelming Soviet forces, these divisions were surrounded and defeated and Russian air support resulted in the death of General Paolo Tarnassi, commander of the Italian armoured force in Russia. On 14 January 1943, after a short pause, the 6th Soviet Army attacked the Alpini divisions of the Italian Mountain Corps. These units had been placed on the left flank of the Italian army and were until then still relatively unaffected by the battle. However, the Alpini position had turned critical after the collapse of the Italian center, the collapse of the Italian right flank, and the simultaneous collapse of the Hungarian troops to the left of the Alpini. The Julia Division and Cuneense Division were destroyed. Members of the 1 Alpini Regiment, part of Cuneese Division, burned the regimental flags to keep them from being captured. Part of the Tridentina Division and other withdrawing troops managed to escape the encirclement. On 26 January 1943, after heavy fighting which resulted in the Battle of Nikolajewka, the Alpini remnants breached the encirclement and reached new defensive positions set up to the west by the Germans. But, by this time, the only operational fighting unit was the Tridentina Division and even it was not fully operational. The Tridentina Division had led the final breakout assault at Nikolajewka. Many of the troops who managed to escape were frostbitten, critically ill, and deeply demoralized. Overall, about 130,000 Italians had been surrounded by the Soviet offensive. According to Italian sources, about 20,800 soldiers died in the fighting, 64,000 were captured, and 45,000 were able to withdraw. When the surviving Italian troops were eventually evacuated to Italy, the Fascist regime tried to hide them from the populace, so appalling was their appearance after surviving the Russian Front. Since the beginning of the Italian campaign in Russia, about 30,000 Italians had been killed and another 54,000 would die in captivity. By the end of February 1943, the rout of the ARMIR was complete. Mussolini then withdrew what remained of his 8th Army from Russian soil. The Italian forces in Russia had been reduced to less than 150,000 men, and 34,000 of these were wounded. The disaster in Russia was a fierce blow to the power and popularity of the dictator. Both sank as the gloomy news soon reached the public in Italy. Survivors blamed the Fascist political elite and the army generals. The survivors said they both had acted irresponsibly by sending a poorly prepared, ill-equipped, and inadequately armed military force to the Russian Front. According to veterans, weapons in Italian service were awful: hand grenades rarely went off and rifles and machine guns had to be kept for a long time on a fire to work properly in extreme climatic conditions, thus often not capable of firing in the midst of battle. The German commanders were accused of sacrificing the Italian divisions, whose withdrawal was supposedly delayed after the Soviet breakthrough, in order to rescue their own troops. Throughout 1943, Italy's fortunes worsened. On 25 July 1943, Benito Mussolini and his Fascist government were put out of power by King Victor Emmanuel III. On 8 September, the new Italian government led by the King and Marshal Pietro Badoglio signed an armistice with the Allies. Soon, competing Italian armed forces were being raised to fight for both the Allies and the Axis. Forces of the Royalist Co-Belligerent Army (Esercito Cobelligerante Italiano, or ECI) were forming in southern Italy. Forces of the Fascist National Republican Army (Esercito Nazionale Repubblicano, or ENR) were forming in northern Italy. The ECI was the army of what was known as "Badoglio's government." The ENR was the army of Mussolini's Italian Social Republic (Repubblica Sociale Italiana, or RSI). Even after the evacuation of the Italian troops from Russia and even after the armistice in 1943, some ENR units remained on the Eastern Front fighting for the Axis. There were five specialized 'smoke cover' battalions serving in defense of Baltic ports. In addition, the 834th Field Hospital continued to operate in Russia, as well as the battalion "IX Settembre"; a small unit that fought alongside the Brandenburgers in East Prussia for a brief period of time. ↑ Rolf-Dieter Muller. "The Unknown Eastern Front: The Wehrmacht and Hitler's Foreign Soldiers". March 27, 2014. Page 73. ↑ "Le operazioni delle unità italiane al fronte russo (1941–1943)", Italian Army Historical Branch, Rome, 1993, p. 102. ↑ Robert Kirchubel. "Operation Barbarossa: The German Invasion of Soviet Russia". Bloomsbury Publishing. Chapter: "Opposing Armies". ↑ "US Military Review, Volume 28". Command and General Staff School, 1949, p. 86. ↑ Cloutier, Patrick. "Regio esercito: the italian royal army in mussolini's wars, 1935-1943". May 15, 2013. Pages 140-141. ↑ Aldo Valori. "La campagna di Russia". Roma, Grafica Nazionale Editrice, 1951. Page 473. ↑ Paoletti, Ciro (2008). A Military History of Italy. Westport, CT: Praeger Security International. p. 177. ISBN 0-275-98505-9. Retrieved 4 December 2009. Corpo di Spedizione Italiano in Russia (CSIR) (Italian Expeditionary Corps in Russia), by Shawn Bohannon. Armata Italiana in Russia (ARMIR) (Italian Army in Russia), by Shawn Bohannon.